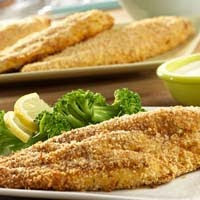 A crunchy cornbread coating on these tender catfish fillets makes a tempting, easy-from-the-oven dinner. Stir the stuffing and paprika on a plate. Beat the egg in a shallow dish with a fork or whisk. Dip the fish into the egg. Coat the fish with the stuffing mixture. Place the fish onto a baking sheet. Drizzle the fish with the butter. Bake at 400 degrees F. for 20 minutes or until the fish flakes easily when tested with a fork. Serve with the salad dressing for dipping. This entry was posted on 7:55 PM and is filed under Fish and Seafood . You can follow any responses to this entry through the RSS 2.0 feed. You can leave a response, or trackback from your own site.